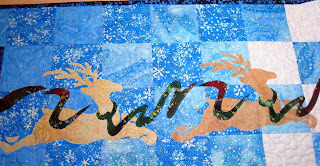 Squash House Quilts: The Elves are Ramping Up! So much to do and only 29 days left until Christmas! The elves here are in high gear! Here is another project that had been languishing in the same drawer as the snowmen, waiting for a bit of finishing detail! It’s Santa’s Midnight Runner by Letitia Hutchings for Mount Redoubt. I just love her designs, but they are a lot of work! 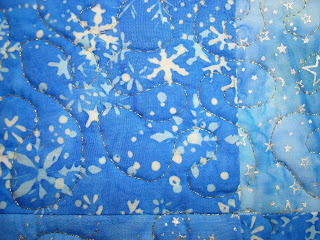 In fact, I am constantly drawn to appliquéd designs. I keep telling myself to never do another one as they involve so much detailed work, but I also never learn from my frustrations - I can’t tell you how many appliqué projects I have done and have purchased for my yet-to-do list! I just love Santa - I had a little of the gold trim from another project left over and though it would be perfect as trim for his sleigh! I used one small bead for his eye, but will add a couple more to make it stand out. I also thought about using a few beads on the tree. I think the reindeer still need something - maybe beads for eyes or maybe a red nose to indicate Rudolf, what do you think? I decided to quilt this one using a gold metallic thread. I'd never used a metallic thread - to be honest - I was a little scared of it. Once I got my rhythm going and made sure I was using the correct needle, it was a breeze! I hope to do a bit more sewing over our 4-day holiday. It will be just my husband and I for Thanksgiving dinner. We always cook a small, fresh turkey, dressing, mashed potatoes and something involving Brussels Sprouts! Oh - and not to forget - pumpkin pie made with soy milk! 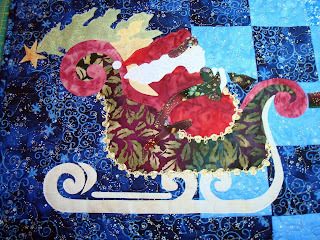 you do fabulous work...santa's sleigh is gorgeous! as for the reindeer? i think black noses on all of them except for rudolph - he gets a red nose! for some reason i think the noses would look better than eyes? Personally, I like the smooth look of the reindeer. The entire piece is amazing! I just think the reindeer provide a place for the eye to rest. They're so beautiful like this. The fabrics you used are amazing and the thread - you go girl!! !